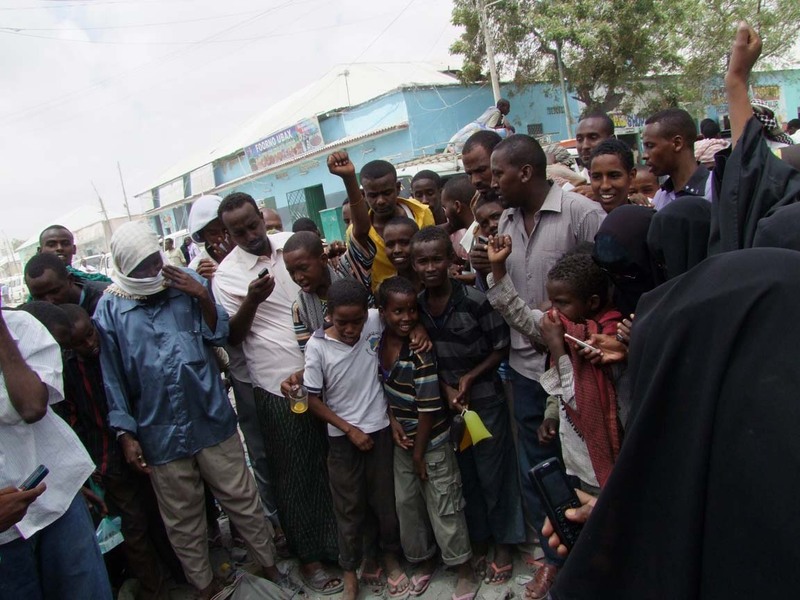 ← Al-Shabab: We Did It! 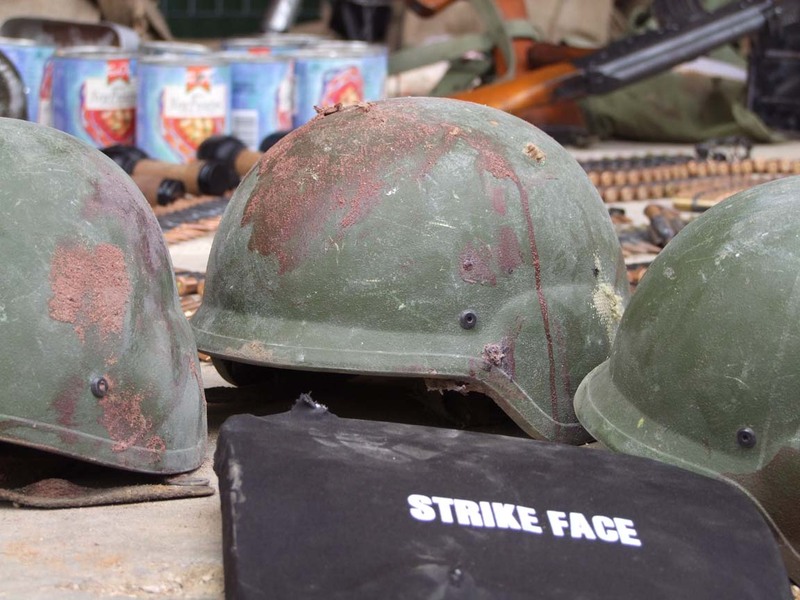 Local residents denouncing AMISOM’s indiscriminate shelling has risen far above the wailing mothers whose sons have perished under the rubble. The TFG has also been severely criticized by the population for failing to put an end to the ‘Bakara genocide’ or ‘Xasuuqa Bakaaraha’ as it is known locallly. It is the Islamists, Al-Shabab, however, who have been commanding the limelight and choreographing events in the last few days, and Mogadishu’s media has been inundated with the gruesome images of AU peacekeeper’s corpses lying in the baking Somali sun or being dragged through the streets by children. 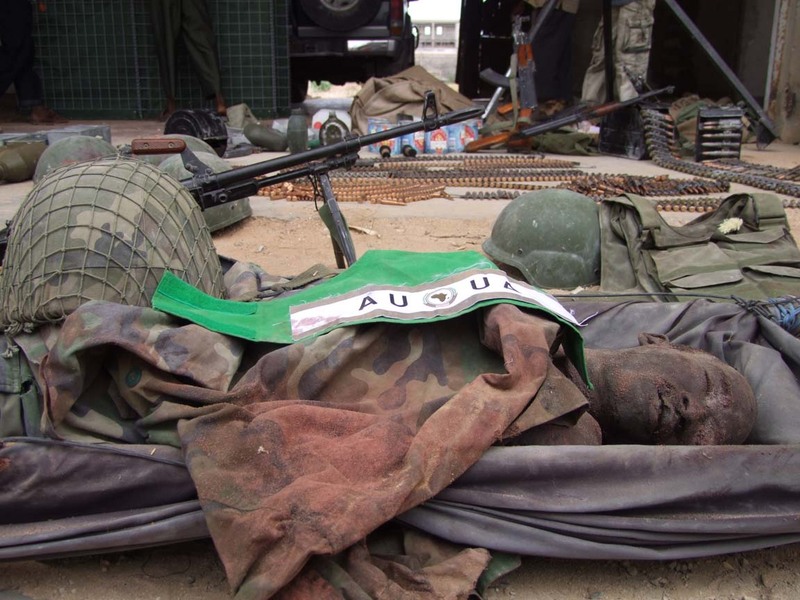 Yesterday morning two Ugandan soldiers were on display in the Maslax compound; today, the corpse of another Ugandan soldier is wasting away in Baar Ubax, surrounded by a crowd of cheerful Al-Shabab supporters eager to dissect it. It is a bleak atmosphere. 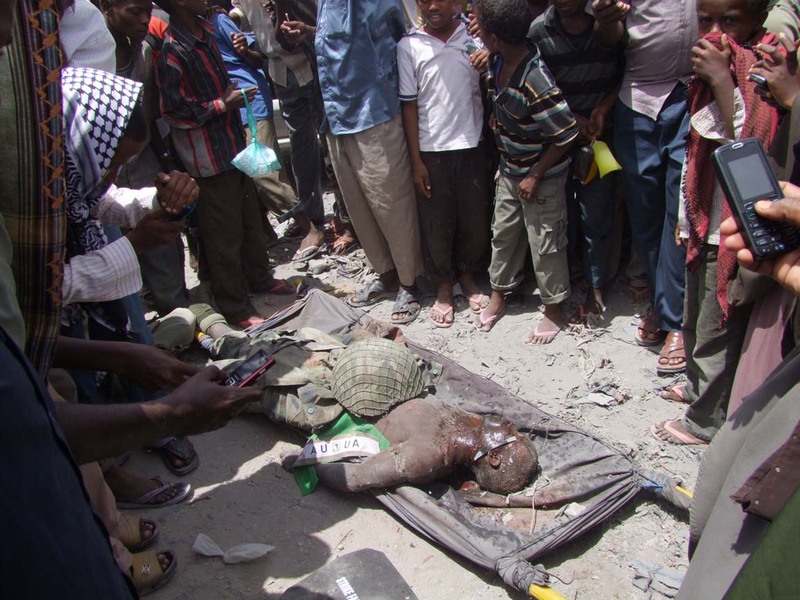 And while the Somali president, Sheikh Sharif, was busy congratulating his Ugandan counterpart for the election victory and for the continued support, the hundreds of chanting residents that huddled around the corpse of the soldier in Baar Ubax were congratulating the Islamists for killing the AU soldiers. 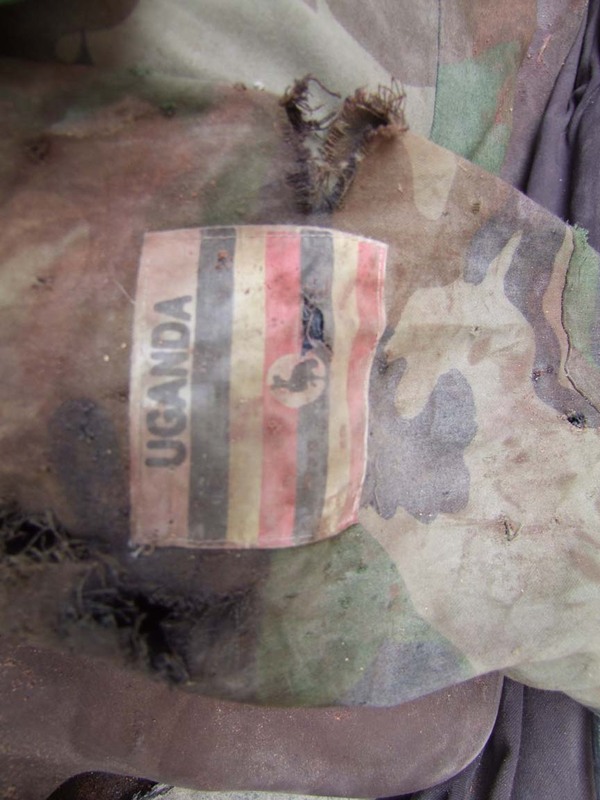 The corpse, dressed in a tattered uniform with a worn out Ugandan flag, still bearing the flamingo emblem, would soon be another statistic in Mogadishu’s merciless terrain. No ceremonial burial awaited him, no soldiers escorted him to the cemetery, no trumpets, no bands and no lugubrious songs of death and despair were sung at his funeral. Only the stumping of feet and the stampede of an uproarious crowd who viewed him as an invader – not a peacekeeper! That is not how you treat a neighbor who comes to stop a fire on your house. 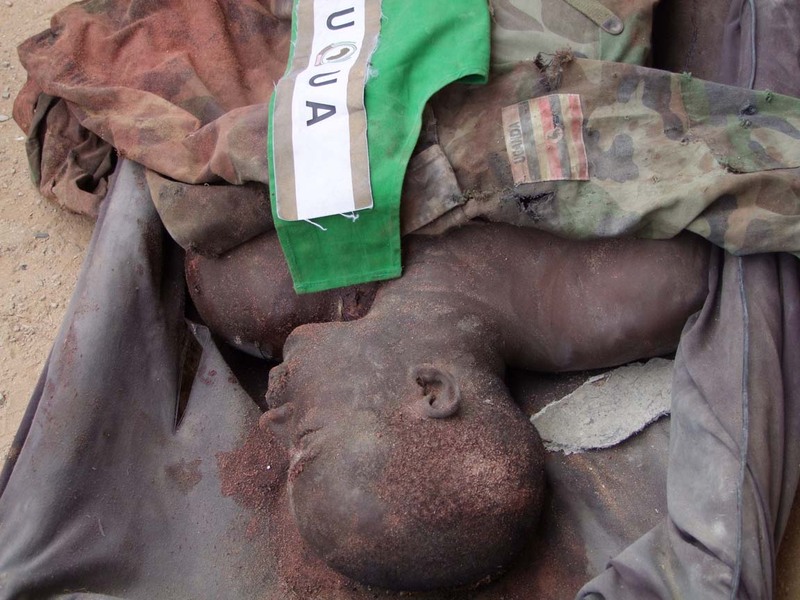 If Al-shabaab thinks killing one Ugandan peace keeper tantamount to victory then lets wait and see the impact of a Ugandan F-16 on them. Remember behind every human being, there is wolf hiding it needs time and circumstances to come out. ( book of psychology). Remember also God does not put burdon on any one , more than his capacity, What one sowed , will Reap the same no thing less nothing more. May God forgive us for our sins, We comitted knowingly or un knowingly.Ameen. 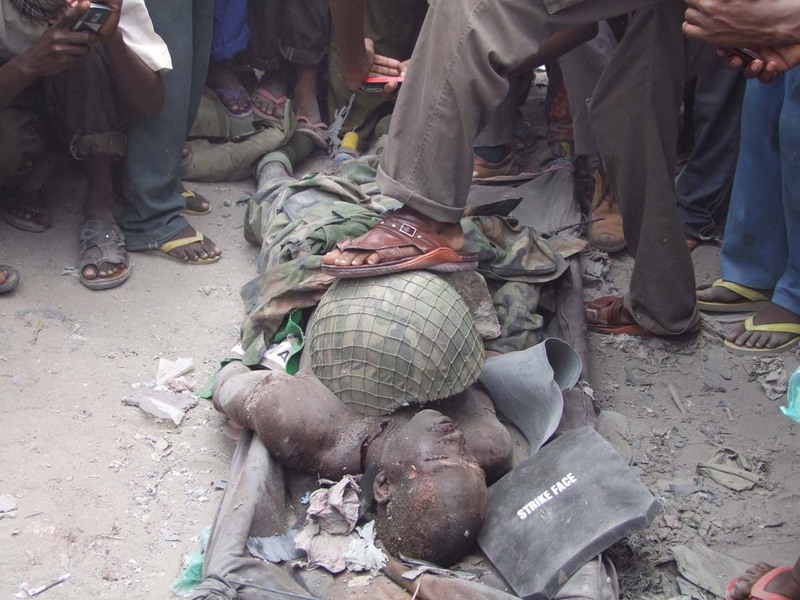 this is very disturbing…don’t know about Ugandans but… why are Burundian being killed in Somalia, their bodies being dragged around by crazy people? They should be back in their country where they are most needed and do their job…Somalians don’t want anybody to interfere in their affairs so…let them go crazy and kill each other…the last thing Burundians need is Al Qaida on our back…right? we got enough problems! This is what you expect of war and Islamic extremists..but well i don’t think Uganda had any serious business there save for pleasing some powers. But why help an ineffective Government..even after the Ugandans and Burundians leave the Government there will fall. What are Somalians doing in Uganda,.. i remember some time back, ugandans wanted to kill them because of this since they are here as refugges. Again, they government should bring back our people since they are taken as invaders hence ugandans should start doing the same to all somalians who are living in our country, eating our food and enjoying the peace.